With all the attention being focused on the BlackBerry Bold, the Storm and the new Curve 8900, another new model from RIM seems to be getting ready to garner some attention of its own. 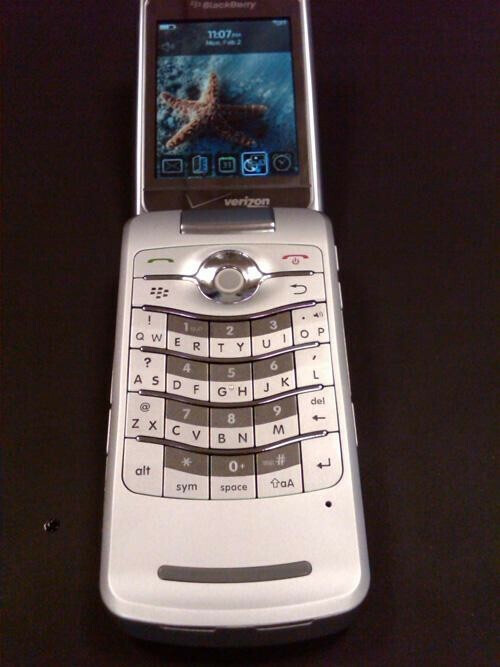 The BlackBerry Pearl Flip 8230 has been captured on film and we can see the distinctive logo on the casing telling us that this is the CDMA model heading for Verizon. While a release date and pricing are both still unknown, we can say that silver appears to be at least one of the color scheme choices for Big Red's customers. With the Sure Type keyboard and clam shell form factor, the Pearl Flip 8230 will certainly find a different audience than the one that has been hanging around the Bold and the Storm. I really like this phone and I think it will be a great seller and that people should really consider it as they go shopping. Something different you know? Hurray! 90% of people who will want this phone will complain to no end about the data plan.